This report is the first in a series examining the magnitude of the teacher shortage and the working conditions and other factors that contribute to the shortage. What this report finds: The teacher shortage is real, large and growing, and worse than we thought. When indicators of teacher quality (certification, relevant training, experience, etc.) are taken into account, the shortage is even more acute than currently estimated, with high-poverty schools suffering the most from the shortage of credentialed teachers. Why it matters: A shortage of teachers harms students, teachers, and the public education system as a whole. Lack of sufficient, qualified teachers and staff instability threaten students’ ability to learn and reduce teachers’ effectiveness, and high teacher turnover consumes economic resources that could be better deployed elsewhere. The teacher shortage makes it more difficult to build a solid reputation for teaching and to professionalize it, which further contributes to perpetuating the shortage. In addition, the fact that the shortage is distributed so unevenly among students of different socioeconomic backgrounds challenges the U.S. education system’s goal of providing a sound education equitably to all children. In recent years, education researchers and journalists who cover education have called attention to the growing teacher shortage in the nation’s K–12 schools. They cite a variety of indicators of the shortage, including state-by-state subject area vacancies, personal testimonials and data from state and school district officials, and declining enrollment in teacher preparation programs.1 These indicators are critical signals. They help analysts detect when there are not enough qualified teachers to fill staffing needs in a labor market that does not operate like other labor markets. School teachers’ wages are not subject to market pressures—they are set by school districts through contracts that take time to negotiate. Therefore, economists can’t use trends in wages—sudden or sustained wage increases—to establish that there is a labor market shortage (as the textbook explanation would indicate). It is also hard to produce direct measurements of the number of teachers needed and available (i.e., “missing”). To date, the only direct estimate of the size of the teacher shortage nationally comes from the Learning Policy Institute’s seminal 2016 report, A Coming Crisis in Teaching? 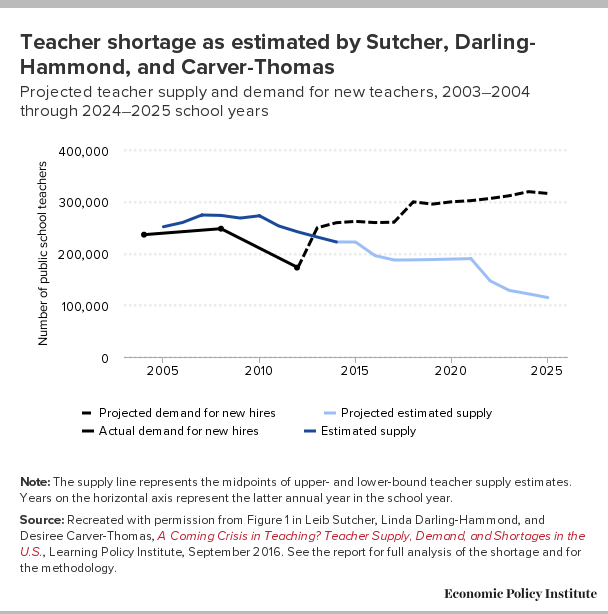 Teacher Supply, Demand, and Shortages in the U.S. (Sutcher, Darling-Hammond, and Carver-Thomas 2016). The report noted that many school districts—finally hiring again after years of teacher layoffs during the Great Recession and in its wake—“had serious difficulty finding qualified teachers for their positions.” As the authors noted, school districts were challenged with not only restoring student-to-teacher ratios to pre-crisis levels but also with broadening curriculum offerings and meeting projected increases in student populations. Defining shortages as “the inability to staff vacancies at current wages with individuals qualified to teach in the fields needed,” the authors estimated that, barring any major changes, the annual teacher shortage would reach about 110,000 by the 2017–2018 school year. Figure A replicates Figure 1 in their report and shows the gap between the supply of teachers available to enter the classroom in a given year and the demand for new hires. As recently as the 2011–2012 school year, the estimated supply of teachers available to be hired exceeded the demand for them—i.e., there was a surplus of teachers in that year’s labor market. But estimated projected demand soon exceeded the estimated supply and the projected gap grew sharply in just a handful of years—from around 20,000 in 2012–2013, to 64,000 teachers in the 2015–16 school year, to over 110,000 in 2017–2018. In other words, the shortage of teachers was projected to more than quadruple in just five years and the gap to remain at those 2017–2018 levels thereafter. Note: The supply line represents the midpoints of upper- and lower-bound teacher supply estimates. Years on the horizontal axis represent the latter annual year in the school year. Source: Recreated with permission from Figure 1 in Leib Sutcher, Linda Darling-Hammond, and Desiree Carver-Thomas, A Coming Crisis in Teaching? Teacher Supply, Demand, and Shortages in the U.S., Learning Policy Institute, September 2016. See the report for full analysis of the shortage and for the methodology. The teacher shortage has serious consequences. A lack of sufficient, qualified teachers threatens students’ ability to learn (Darling-Hammond 1999; Ladd and Sorensen 2016). Instability in a school’s teacher workforce (i.e., high turnover and/or high attrition) negatively affects student achievement and diminishes teacher effectiveness and quality (Ronfeldt, Loeb, and Wyckoff 2013; Jackson and Bruegmann 2009; Kraft and Papay 2014; Sorensen and Ladd 2018). And high teacher turnover consumes economic resources (i.e., through costs of recruiting and training new teachers) that could be better deployed elsewhere. Filling a vacancy costs $21,000 on average (Carver-Thomas and Darling-Hammond 2017; Learning Policy Institute 2017) and Carroll (2007) estimated that the total annual cost of turnover was $7.3 billion per year, a cost that would exceed $8 billion at present.2 The teacher shortage also makes it more difficult to build a solid reputation for teaching and to professionalize it, further perpetuating the shortage. We argue that, when issues such as teacher quality and the unequal distribution of highly qualified teachers across schools serving different concentrations of low-income students are taken into consideration, the teacher shortage problem is much more severe than previously recognized. The current national estimates of the teacher shortage likely understate the magnitude of the problem because the estimates consider the new qualified teachers needed to meet new demand. However, not all current teachers meet the education, experience, and certification requirements associated with being a highly qualified teacher. Figure C shows how the share of teachers without each of the quality credentials has grown since the 2011–2012 school year (building on the Department of Education’s Schools and Staffing Survey data from 2011–2012). The shares of teachers not holding these credentials are not negligible. Notes: Data are for teachers in public noncharter schools. According to research and to the U.S. Department of Education, highly qualified teachers have the following four credentials: They are fully certified (with a regular, standard state certificate or advanced professional certificate versus not having completed all the steps); they took a traditional route into teaching (participated in a traditional certification program versus an alternative certification program, the latter of which is defined in the teacher survey questionnaire as “a program that was designed to expedite the transition of nonteachers to a teaching career, for example, a state, district, or university alternative certification program”); they are experienced (have more than 5 years of experience); and they have a background in the subject of main assignment, i.e., they have a bachelor's or master's degree in the main teaching assignment field (general education, special education, or subject-matter specific degree) versus having no educational background in the subject of main assignment. 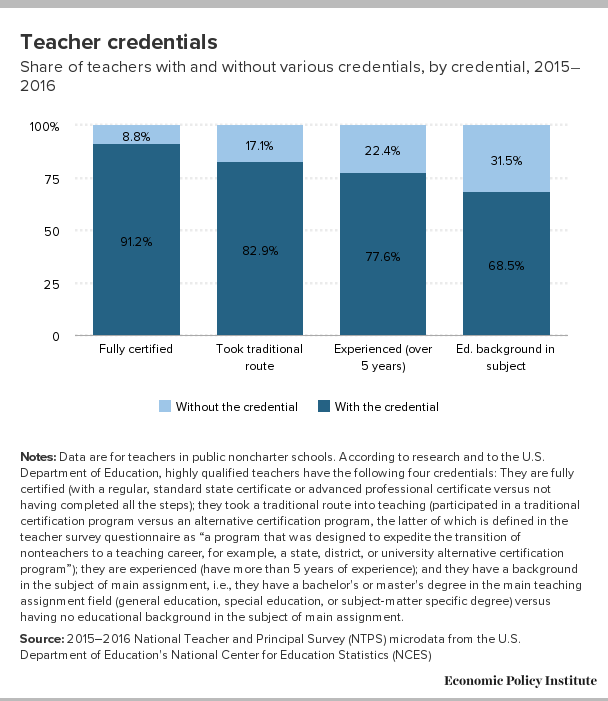 As Figure B shows, as of 2015–2016, there are significant shares of teachers without the credentials associated with being a highly qualified teacher. For example, 8.8 percent of teachers do not have a standard state certificate or advanced professional certificate (i.e., they are not fully certified), and 17.1 percent have followed an alternative route into teaching. Nearly one in four teachers (22.4 percent) has five or fewer years of experience. And, as shown in Figure C, almost one in ten (9.4 percent) has fewer than two years of experience, i.e., are novices. Moreover, nearly a third of teachers (31.5 percent) do not have an education background in their subject of main assignment. Moreover, as Figure C shows, the share of teachers without the credentials of highly qualified teachers has roughly stayed the same or increased since the 2011–2012 school year, growing the shortage of highly qualified teachers. While the shares of teachers who aren’t fully certified and who don’t have an educational background in the main subject that they are teaching increased by only 0.4 percentage points, the share of teachers who took an alternative route into teaching and the share of inexperienced teachers increased by between 2 and 3 percentage points. 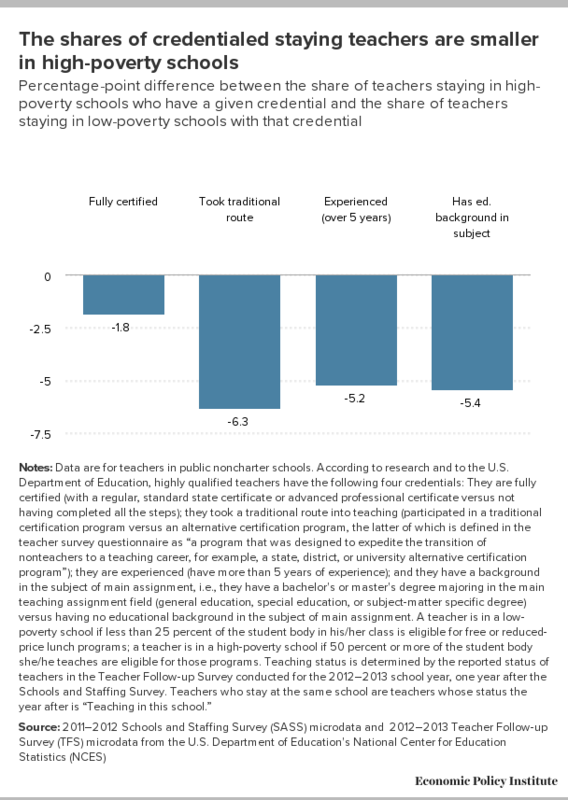 Second, although teachers with stronger credentials are less likely to quit the profession or move to a different school,7 the link between strong credentials and retention might be less powerful in high-poverty schools. It would not be surprising to find that the retention power of strong credentials varies across schools, given the research showing that other factors are dependent on school poverty.8 This weakened retention effect could also apply to new teachers who don’t have experience but who have the other credentials of highly qualified teachers, meaning strong new teachers would be looking at alternatives to the low-income schools where they are more likely to begin their careers. We examine the same National Teacher and Principal Survey data from 2015–2016 now to show that the share of teachers who are highly qualified is smaller in high-poverty schools than in low-poverty schools. In this analysis, due to available information, we look at the composition of the group of students under the teacher’s instruction (instead of the student body composition of the school, which is the standard metric used to describe school poverty).9 We consider a teacher to be working in a low-poverty school if less than 25 percent of the students in the teacher’s class are eligible for free or reduced-price lunch programs. A teacher is in a high-poverty school if 50 percent or more of his or her students are eligible for those programs. We find that low-income children are consistently, albeit modestly, more likely to be taught by lower-credentialed and novice teachers, as shown in the third and fourth columns in Table 1. In high-poverty schools, the share of teachers who are not fully certified is close to three percentage points higher than it is in low-poverty schools. Also relative to low-poverty schools, the share of inexperienced teachers (teachers with five years or less of experience) is 4.8 percentage points higher in high-poverty schools; the share of teachers who followed an alternative route into teaching is 5.6 percentage points higher in high-poverty schools; and the share of teachers who don’t have educational background in their subject of main assignment is 6.3 percentage points higher in high-poverty schools. 91.2% 92.9% 90.1% -2.8 ppt. 8.8% 7.1% 9.9% 2.8 ppt. 82.9% 86.7% 81.1% -5.6 ppt. 17.1% 13.3% 18.9% 5.6 ppt. 77.6% 80.2% 75.4% -4.8 ppt. 54.3% 56.1% 53.3% -2.8 ppt. 23.3% 24.1% 22.1% -2.0 ppt. 22.4% 19.8% 24.6% 4.8 ppt. 9.4% 8.0% 10.4% 2.4 ppt. 13.0% 11.8% 14.2% 2.4 ppt. 68.5% 72.5% 66.2% -6.3 ppt. 31.5% 27.5% 33.8% 6.3 ppt. Notes: Data are for teachers in public noncharter schools. According to research and to the U.S. Department of Education, highly qualified teachers have the following four credentials: They are fully certified (with a regular, standard state certificate or advanced professional certificate versus not having completed all the steps); they took a traditional route into teaching (participated in a traditional certification program versus an alternative certification program, the latter of which is defined in the teacher survey questionnaire as “a program that was designed to expedite the transition of nonteachers to a teaching career, for example, a state, district, or university alternative certification program”); they are experienced (have more than 5 years of experience); and they have a background in the subject of main assignment, i.e., they have a bachelor's or master's degree in the main teaching assignment field (general education, special education, or subject-matter specific degree) versus having no educational background in the subject of main assignment. A teacher is in a low-poverty school if less than 25 percent of the student body in his/her class is eligible for free or reduced-price lunch programs; a teacher is in a high-poverty school if 50 percent or more of the student body she/he teaches are eligible for those programs. When looking across types of schools, two factors further contribute to the shortage of highly qualified teachers in high-poverty schools. First, while the data still confirm that higher credentials deter attrition (in this analysis, shown descriptively), we find that this link between quality and retention is weaker in high-poverty schools, and this leads to a relative leakage of credentials through attrition in high-poverty schools. We present our own analysis of these links in Table 2. In both high- and low-poverty schools, the credentials of teachers who stay in the school are better than those of teachers who quit teaching altogether. But the differences are narrower for teachers in high-poverty schools (with the exception of the share of teachers who majored in their subject of main assignment). Notes: Data are for teachers in public noncharter schools. According to research and to the U.S. Department of Education, highly qualified teachers have the following four credentials: They are fully certified (with a regular, standard state certificate or advanced professional certificate versus not having completed all the steps); they took a traditional route into teaching (participated in a traditional certification program versus an alternative certification program, the latter of which is defined in the teacher survey questionnaire as “a program that was designed to expedite the transition of nonteachers to a teaching career, for example, a state, district, or university alternative certification program”); they are experienced (have more than 5 years of experience); and they have a background in the subject of main assignment, i.e., they have a bachelor's or master's degree majoring in the main teaching assignment field (general education, special education, or subject-matter specific degree) versus having no educational background in the subject of main assignment. A teacher is in a low-poverty school if less than 25 percent of the student body in his/her class is eligible for free or reduced-price lunch programs; a teacher is in a high-poverty school if 50 percent or more of the student body she/he teaches are eligible for those programs. Teaching status is determined by the reported status of teachers in the Teacher Follow-up Survey conducted for the 2012–2013 school year, one year after the Schools and Staffing Survey. Teachers who stay at the same school are teachers whose status the year after is “Teaching in this school.” Teachers who left teaching are those who generated a vacancy in the 2012–2013 school year and are not in the profession (they left teaching, were on long-term leave, or were deceased). Not included in the table are teachers who generated a vacancy in the school year but remained in the profession (i.e., left to teach in another school or were on short-term leave and planned to return to the school). Whereas Table 2 presents gaps between the share of staying teachers with a given quality credential and the share of quitting teachers with that credential (for both low- and high-poverty schools), Figure D pulls data from Table 2 on staying teachers to present another type of gap: the gap between shares of staying teachers in high-poverty schools with a given quality credential and the shares of staying teachers in low-poverty schools with a given quality credential.10 The figure shows that teachers who stay in high-poverty schools are less qualified than teachers who stay in low-poverty schools. It also shows that relative to staying teachers in low-poverty schools, the share of staying teachers in high-poverty schools who are certified is smaller (by a gap of 1.8 percentage points), the share who entered the profession through a traditional certification program is smaller (by 6.3 percentage points), the share who have an educational background in the subject of main assignment is also smaller (by 5.4 percentage points), and the share who have more than five years of experience is also smaller (by 5.2 percentage points). There is no sign that the large shortage of credentialed teachers—overall, and especially in high-poverty schools—will go away. In light of the harms this shortage creates, as well as its size and trends, it is critical to understand the nature of the problem and the complexity of the teacher labor market. Only when we understand the factors that contribute to the growing shortage of high-quality teachers can we design policy interventions—and better guide institutional decisions—to find the “missing” teachers. Schools struggle to find and retain highly qualified individuals to teach, and this struggle is tougher in high-poverty schools (report #2). A dwindling pool of applicants and excessive teacher attrition make staffing schools difficult. With the number of students completing teacher preparation programs falling dramatically, and with significant rates of attrition and turnover in the profession, it should be no surprise that schools report difficulties in hiring and, in some cases, do not hire anyone to fill vacancies. The difficulties are greater in high-poverty schools. The share of schools that are hiring, the difficulty in filling vacancies, and the share of unfilled vacancies all increased in the past few years. Low teacher pay is reducing the attractiveness of teaching jobs, and is an even bigger problem in high-poverty schools (report #3). Teachers have long been underpaid compared with similarly educated workers in other professions, with a pay gap that has grown substantially in the past two decades. In high-poverty schools, teachers face a double disadvantage, as they are further underpaid relative to their peers in low-poverty schools. The tough school environment is demoralizing to teachers, especially so in high-poverty schools (report #4). Teachers report that student absenteeism, class-cutting, student apathy, lack of parental involvement, poor student health, poverty, and other factors are a problem. Larger shares of teachers also report high levels of stress and fears for their safety. The school climate is tougher in high-poverty schools. Relative to their peers in low-poverty schools, teachers in high-poverty schools are less likely to say they intend to continue to teach and more likely to say they think about transferring to another school. Teachers—especially in high-poverty schools—aren’t getting the training, early career support, and professional development opportunities they need to succeed and this too is keeping them, or driving them, out of the profession (report #5). The lack of supports that are critical to succeeding in the classroom and the unsatisfactory continued training makes teaching less attractive and impedes its professionalization. Teachers in high-poverty schools devote a slightly larger share of their hours to delivering instruction, and fewer of them have scheduled time for professional development. Together, these factors, their trends, and the lack of proper comprehensive policy attention countering them have created a perfect storm in the teacher labor market, as evident in the spiking shortage of highly qualified teachers, especially in high-poverty schools. The sixth and final report in the series calls for immediate policy steps to address this national crisis. The analyses presented in this series of reports mainly rely on the Schools and Staffing Survey (SASS) 2011–2012, the Teacher Follow-up Survey (TFS) 2012–2013, and the National Teacher and Principal Survey (NTPS) 2015–2016.12 The surveys are representative of teachers, principals, and schools in the 50 states and the District of Columbia.13 All three surveys were conducted by the U.S. Census Bureau for the U.S. Department of Education. The survey results are housed in the National Center for Education Statistics (NCES), which is part of the Department of Education’s Institute of Education Sciences (IES). The NTPS is the redesigned SASS, with a focus on “flexibility, timeliness, and integration with other Department of Education data” (NCES 2019). Both the NTPS and SASS include very detailed questionnaires at the teacher level, school level, and principal level, and the SASS also includes very detailed questionnaires at the school district level (NCES 2017). The TFS survey, which is the source of data on teachers who stay or quit, was conducted a year after the SASS survey to collect information on the employment and teaching status, plans, and opinions of teachers in the SASS. Following the first administration of the NTPS, no follow-up study was done, preventing us from conducting an updated analysis of teachers by teaching status the year after. NCES plans to conduct a TFS again in the 2020–2021 school year, following the 2019–2020 NTPS. The 2015–2016 NTPS includes public and charter schools only, while the SASS and TFS include all schools (public, private, and charter schools).14 We restrict our analyses to public schools and teachers in public noncharter schools. Elaine Weiss is the lead policy analyst for income security at the National Academy of Social Insurance, where she spearheads projects on Social Security, unemployment insurance, and workers’ compensation. Prior to her work at the academy, Weiss was the national coordinator for the Broader Bolder Approach to Education, a campaign launched by the Economic Policy Institute, from 2011–2017. BBA promoted a comprehensive, evidence-based set of policies to allow all children to thrive in school and life. Weiss has coauthored and authored EPI and BBA reports on early achievement gaps and the flaws in market-oriented education reforms. She is coauthoring Broader, Bolder, Better, a book with former Massachusetts Secretary of State Paul Reville that will be published by Harvard Education Press in June 2019. Weiss came to BBA from the Pew Charitable Trusts, where she served as project manager for Pew’s Partnership for America’s Economic Success campaign. She has a PhD. in public policy from the George Washington University Trachtenberg School and a J.D. from Harvard Law School. The authors are grateful to Lora Engdahl for her extraordinary contributions to structuring the contents of this series of papers, and for her edits to this piece. We are also thankful to John Schmitt for coordination and supervision of this project. A special thank you is noted for Desiree Carver-Thomas, her coauthors Leib Sutcher and Linda Darling-Hammond, and the Learning Policy Institute for granting us access to the data used in Figure 1 in their report U.S. (Sutcher, Darling-Hammond, and Carver-Thomas 2016). We also want to acknowledge Lawrence Mishel for his guidance in earlier stages of the development of this research. We appreciate Julia Wolfe for her help preparing the tables and figures in this report, Kayla Blado for her work disseminating the report and her assistance with the media, and EPI communications director Pedro da Costa and the rest of the communications staff at EPI for their contributions to the different components of this report and the teacher shortage series. 1. See, for examples in the media, Strauss 2015; Rich 2015, Westervelt 2015, Strauss 2017. The Department of Education publishes the “States’ Reports of Teacher Shortage Areas (TSA)” on a yearly basis. These are areas in which the states expect to have vacancies (these are not lists of official job openings. For the historical TSA report, see U.S. Department of Education 2017; 2019. We note the change in the media’s focus over the course of the development of this study, with the media now covering the conditions under which teachers work, and the numerous teacher strikes demonstrating those conditions. 2. See Strauss 2017 for a blog post written by Linda Darling-Hammond, Leib Sutcher, and Desiree Carver-Thomas. The authors noted that a cost of over $7 billion in the 2007 study would translate to over $8 billion today. Note that this is an estimate of the cost of turnover/attrition, not an estimate of the cost of the shortage. 3. Regarding alternative certification—certification via programs designed to expedite the transition of nonteachers to a teaching career and offered both by institutions of higher education but also many other entities—Fraser and Lefty (2018) explain, “University faculty have written research-based studies, most of which seem to conclude that the university is the proper home for teacher preparation and that the rise of alternative routes is a mostly negative development. On the other hand, advocates of alternative approaches claim that education schools are hopelessly stuck and unlikely to reform, and that alternative routes represent the optimal way to prepare new teachers for twenty-first-century classrooms.” Research on the effectiveness of teachers who entered teaching through alternative pathways finds these teachers are, in general, not more effective than teachers who entered through traditional programs (Whitford, Zhang, and Katsiyannis 2017; Clark et al. 2017; Kane, Rockoff, and Staiger 2008), and that teachers who entered through alternative pathways are more likely to quit (Redding and Smith 2016). For a recent review on how credentials matter for teacher effectiveness, see Coenen et al. (2017). 4. Section 9101(23) of the Elementary and Secondary Education Act of 1965 (ESEA), which was last reauthorized in 2015 (and renamed the Every Student Succeeds Act or ESSA), defines the term “highly qualified.” The definition can be found on the U.S. Department of Education’s “Laws & Guidance” page for Title IX at http://www.ed.gov/policy/elsec/leg/esea02/pg107.html#sec9101. The states’ equity profiles can be found on the U.S. Department of Education’s “Laws & Guidance” page for Equitable Access to Excellent Educators at https://www2.ed.gov/programs/titleiparta/resources.html. 5. The research evidence clearly shows that school poverty influences turnover and attrition of teachers—two drivers of shortages. But, to date, researchers have not produced any estimate of the gap between the number of highly qualified teachers needed and the number available to be hired in high-poverty schools. For evidence of the influence of school poverty on turnover and attrition, see, among others, Sutcher, Darling-Hammond, and Carver-Thomas 2016; Podolsky et al. 2016; Loeb, Darling-Hammond, and Luczak 2005; Ingersoll, Merrill, and Stuckey 2014; Darling-Hammond 2010; and Simon and Johnson 2015. 6. See Adamson and Darling-Hammond 2012; Clotfelter et al. 2006; Darling-Hammond 2004; Isenberg et al. 2013; García and Mishel 2016; Baker 2018, chapter 3. 7. For some of these quality credentials, the relationship is not linear, but curvilinear or U-shaped. Borman and Dowling (2008) find greater odds of attrition “among those who have no graduate degree, have regular certifications, have more years of experience, and score relatively lower on some standardized tests,” though they acknowledge that these factors can change across a teacher’s life span and career path. Both early career teachers and teachers close to retirement are more likely to quit (Allensworth, Ponisciak, and Mazzeo, 2009; Guarino, Santibáñez, and Daley, 2006; Ingersoll 2001), which creates a U-shaped curve describing the relationship between attrition and age or experience. For other credentials, some also find that higher rates of turnover are associated with both the strongest and weakest education credentials (Marinell and Coca 2013, for New York City). Our research does not consider having specialized degrees in math and science a high-quality credential, but an attribute of teachers. These teachers may be more likely to leave a school or quit teaching for reasons that have to do with the wider availability of STEM-related opportunities outside of teaching in our economy. 8. Loeb, Darling-Hammond, and Luczak (2005), for example, find that the measured influence of school characteristics on turnover is sensitive to the introduction of variables measuring working conditions (such as salaries, class sizes, facilities problems, lack of textbooks, etc.) in the specification, which indicates the link between conditions and school poverty. The authors do not conduct separate analyses (nor use interaction terms), but in their sequence of models, the credential variables’ coefficients are sensitive in size and statistical significance to the introduction of a control for school poverty and also the variables measuring working conditions. See also references in Endnote 7. 9. Although in this series we use share of low-income students to examine (in)equities in the teacher shortage across schools, we could alternatively employ other indicators of disadvantage—such as share of minority students, students with disabilities, or students who are English Language Learners—which could also enlighten us about other sets of inequities. Generically, schools with high concentrations of these subgroups are sometimes referred to as “high-needs” schools. 10. The lower credentials of staying teachers in high-poverty schools relative to low-poverty schools are the result of the patterns shown in Tables 1 and 2: one, that the credentials of teachers in high-poverty schools are lower than in high-poverty schools; and two, that the link between attrition and credentials is weaker in high-poverty schools, allowing for highly qualified teachers to move or quit the profession at different rates for similar credentials across the two types of schools. 12. We use other data from the NCES and DOE, which will be cited appropriately in later studies. 13. The 2015–2016 NTPS does not produce state-representative estimates. The forthcoming 2017–2018 NTPS will support state-level estimates. 14. The forthcoming 2017–2018 NTPS additionally includes the private sector. Adamson, Frank, and Linda Darling-Hammond. 2012. “Funding Disparities and the Inequitable Distribution of Teachers: Evaluating Sources and Solutions.” Education Policy Analysis Archives 20, no. 37. Baker, Bruce D. 2018. Educational Inequality and School Finance. Why Money Matters for America’s Students. Cambridge, Mass. : Harvard Education Press. Borman, Geoffrey D., and N. Maritza Dowling. 2008. “Teacher Attrition and Retention: A Meta-Analytic and Narrative Review of the Research.” Review of Educational Research 78, no. 3: 367–409. https://doi.org/10.3102/0034654308321455. Clotfelter, Charles, Helen F. Ladd, Jacob Vigdor, and Justin Wheeler. 2006. “High-Poverty Schools and the Distribution of Teachers and Principals.” North Carolina Law Review 85: 1345–1379. Coenen, Johan, Ilja Cornelisz, Wim Groot, Henriette Maassen van den Brink, and Chris Van Klaveren. 2017. “Teacher Characteristics and Their Effects on Student Test Scores: A Systematic Review.” Journal of Economic Surveys 32, no. 3: 848–877. https://doi.org/10.1111/joes.12210. Darling-Hammond, Linda. 2004. “Inequality and the Right to Learn: Access to Qualified Teachers in California’s Public Schools.” Teachers College Record 106, no. 10: 1936–1966. Darling-Hammond, Linda. 2010. The Flat World and Education: How America’s Commitment to Equity Will Determine Our Future. New York: Teachers College Press. García, Emma, and Lawrence Mishel. 2016. Unions and the Allocation of Teacher Quality in Public Schools. Economic Policy Institute, April 2016. Ingersoll, Richard M., Lisa Merrill, and Daniel Stuckey. 2014. Seven Trends: The Transformation of the Teaching Force. Consortium for Policy Research in Education, University of Pennsylvania, CPRE Report no. RR-80, updated April 2014. Isenberg, Eric, Jeffrey Max, Philip Gleason, Liz Potamites, Robert Santillano, Heinrich Hock, and Michael Hansen. 2013. Access to Effective Teaching for Disadvantaged Students. National Center for Education Evaluation and Regional Assistance, Institute of Education Sciences, U.S. Department of Education, November 2013. Jackson, Kirabo, and Elias Bruegmann. 2009. “Teaching Students and Teaching Each Other: The Importance of Peer Learning for Teachers.” American Economic Journal Applied Economics 1, no. 4: 85–108. Kini, Tara, and Anne Podolsky. 2016. Does Teaching Experience Increase Teacher Effectiveness? A Review of the Research. Learning Policy Institute, June 2016. Kraft, Matthew A., and John P. Papay. 2014. “Can Professional Environments in Schools Promote Teacher Development? Explaining Heterogeneity in Returns to Teaching Experience,” Educational Evaluation and Policy Analysis 36, no. 4: 476–500. Learning Policy Institute. 2017. What’s the Cost of Teacher Turnover? (calculator). September 2017. Loeb, Susanna, Linda Darling-Hammond, and John Luczak. 2005. “How Teaching Conditions Predict Teacher Turnover in California Schools.” Peabody Journal of Education 80, no. 3: 44–70. Marinell, William H., and Vanessa M. Coca. 2013. Who Stays and Who Leaves? Findings from a Three-Part Study of Teacher Turnover in NYC Middle Schools. Research Alliance for New York City Schools, March 2013. National Center for Education Statistics (NCES) (U.S. Department of Education). 2011–2012. Licensed microdata from the 2011–2012 Schools and Staffing Survey (SASS). National Center for Education Statistics (NCES) (U.S. Department of Education). 2012–2013. Licensed microdata from the 2012–2013 Teacher Follow-up Survey (TFS). National Center for Education Statistics (NCES) (U.S. Department of Education). 2015–2016. Licensed microdata from the 2015-2016 National Teacher and Principal Survey (NTPS). Simon, Nicole S., and Susan Moore Johnson. 2015. Teacher Turnover in High-Poverty Schools: What We Know and Can Do. Teachers College Record 117: 1–36. Sorensen, Lucy C., and Helen Ladd. 2018. “The Hidden Costs of Teacher Turnover.” National Center for Analysis of Longitudinal Data in Education Research (CALDER) Working Paper No. 203-0918-1. Strauss, Valerie. 2015. “The Real Reasons Behind the U.S. Teacher Shortage,” Washington Post, August 24, 2015. Strauss, Valerie. 2017. “Why It’s a Big Problem That So Many Teachers Quit—and What to Do About It,” Washington Post, November 27, 2017. U.S. Department of Education. 2017. Teacher Shortage Areas Nationwide Listing. 1990–1991 through 2017–2018. June 2017. U.S. Department of Education. 2019. “Office of Postsecondary Education: Teacher Shortage Areas” (webpage), accessed March 2019. Westervelt, Eric. 2015. “Where Have All the Teachers Gone?,” NPR’s All Things Considered, March 3, 2015.